↑ "Weatherbase: Historical Weather for Batdambang, Cambodia". Weatherbase. 2011. Retrieved on November 24, 2011. Analyzing Development Issues Trainees, ADI Team, and Cooperation Committee for Cambodia. Labour Migration to Thailand and the Thai-Cambodian Border Recent Trends in Four Villages of Battambang Province. Small-scale research report. [Phnom Penh? ]: Cooperation Committee for Cambodia, 2003. Kassie, Alebachew, and Nguon Sokunthea. Credit and Landlessness Impact of Credit Access on Landlessness in Cheung Prey and Battambang Districts. Phnom Penh: Oxfam GB Cambodia Land Study Project, 2000. Mourer, Cécile, and Roland Mourer. The Prehistoric Industry of Laang Spean, Province of Battambang, Cambodia. Sydney: Australasian Medical Pub, 1970. Tūc, Jhuaṅ. 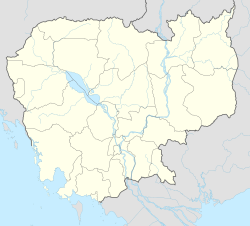 Battambang During the Time of the Lord Governor. Phnom Penh: Cedoreck, 1994. Vinary, Vonn. "All Our Livelihoods Are Dead" Landlessness and Aquatic Resources in Battambang Province. [Phnom Penh]: Oxfam GB Cambodia Land Study Project, 2000. Wallgren, Pia, and Ray Sano. Report on the Reconciliation Areas Based on in-Depth Interviews Conducted in Six Villages in Battambang, Banteay Meanchey and Siem Reap Provinces. Phnom Penh: UNDP/CARERE, 2000. หน้านี้แก้ไขล่าสุดเมื่อวันที่ 8 เมษายน 2562 เวลา 21:03 น.